Ashgabat (ITAR-TASS) – The press service of the Turkmen government reported Turkmenistan will hold in early September its first time naval exercises in the Caspian Sea. Edermen is the first of the two missile ships sold by Russia to Turkmenistan in their technical military co-operation agreement signed in 2008. Both vessels are attached to the port of Turkmenbashi. Named Khazar-2012 (Khazar is an alternate name of the Caspian Sea), these tactical exercises comes after a summer of somewhat heightened tensions with Azerbaijan over natural gas fields in a contested part of the sea. The plan for a modern navy building in the Caspian was announced in August 2009 at a meeting of the Security Council. In 2010, the Naval Institute was created and the Ministry of Defence designed and approved a program for the Navy until 2015. 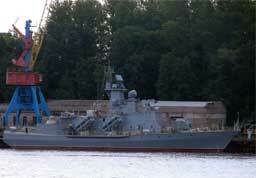 In 2011, Russia delivered to Turkmenistan two missile-equipped corvettes of class Lightning, built in Nevsky Shipyards. They are called Edermen (“Valiant”) and Gayratly (“Bold”). Turkmenistan had also previously acquired Russian patrol boats Sable, Ukrainian patrol boats like Kalkan-M and T-Neck and leased Iranian Coast Guard cutter and one destroyer. Turkmenistan annually conducts routine military-tactical exercises Galkan (“Shield”) in the training centre of the Ministry of Defence situated in mountainous region of South Kelyata.